Made by Linton, JAB (Jamie) in Perth, Western Australia, Australia, 1930-1940. 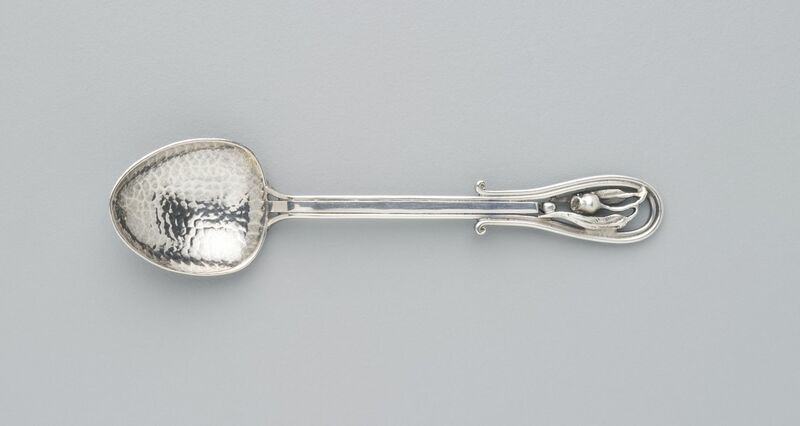 A hand wrought silver spoon with a large round beaten bowl and massive handle. The decorative openwork finial features a gumnut with leaves. The marks 'STGSILVER", 'JAL' and a gumnut are stamped on the back of the stem. Marks stamped on the back of the stem: 'STGSILVER", 'JAL' and a gumnut. Designed by JAB (Jamie) Linton in Perth in the 1930s. Jamie Linton (1904-1980) was mostly trained by his father and at the Central School of Arts and Crafts in London. A painter, sculptor and teacher, in the late 1920s he turned to making a living as a silversmith, becoming one of Australia's best known metalworkers by the end of World War 2.